…and as promised, I’m telling you about a New Source. Ok, it’s been around awhile, but it is new to this blog. Goodwill has a national auction website listing all sorts of goods from around the country. The catch is, there is a lot more competition for the good stuff, and you have to pay shipping and handling, but sometimes great things do slip through the cracks. Yes, you are taking a bit of a risk buying off the pictures alone, but if the listing was wrong in any way, you can return the item (minus shipping of course.) 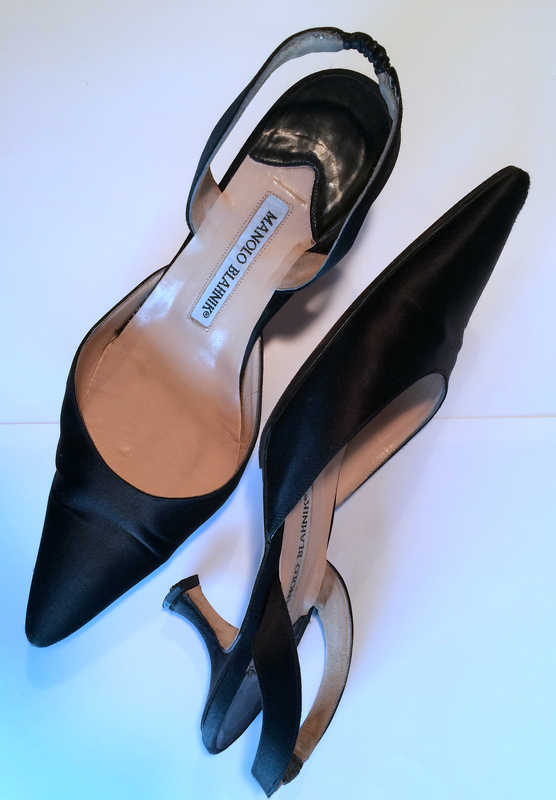 A couple weeks ago I scored big on a nice pair of classic black satin kitten heel Manolo Blahniks in excellent condition. The photos were not very good, and I’m guessing that is why not many people were bidding on them. I took a chance and got a great deal, only $14! I did have to add shipping and handling, so the total was $21, still WELL worth it. This entry was posted in designer clothing, fashion, shopping, Thrift store shopping, thrifting and tagged Celine, designer finds, designer thift store finds, Dolce & Gabbana, Dolce Gabanna, Goodwill, goodwill finds, Manolo Blahnik, thrift store, thrifting. Bookmark the permalink.